It has been awhile since we first looked at some pre-painted 15mm building choices. Unfortunately, Battlefront has still not released any northwest European buildings in their Battlefield in a Box line. Luckily we recently discovered the 15mm buildings from Landmark. They are very nicely done resin-cast pre-painted buildings. They have a feel closer to china or ceramic as opposed to the more plastic feel of other resin buildings (I think this is due more to the crisp casting than the actual material). The castings are extremely crisp and clean and the painting is also very clean and well done. So much so that they almost look too nice on the table! They certainly give a pre-battle feel to the tabletop. Size wise the Landmark buildings are a bit smaller than the ones from The Miniature Building Authority but will mix just fine especially if you base them. The MBA buildings already have a small base built-in. The door heights, about 20mm high, are the same for both lines. JR building’s doors are a tad larger at 22mm high. Of course no two houses are the same and all of these lines are modeling different homes so these small differences really do not matter on the table. For comparison, the Landmark Norman Cafe building is 2 1/4″ x 1 1/4″ wide x 3″ tall. The Landmark buildings are all single piece and do not come apart in any way. But they are hollow and Flames of War command stands will easily fit underneath even the smallest of them. Standard sized FoW stands will not fit except under the larger buildings and even with some of those you may need to use a Dremel tool on the inside edges of the building to allow them to fit. What makes the Landmark line really nice is not just the quality of the buildings but the nice selection available (about 15 so far), and best of all, they cost about half as much as those of the other manufacturers. 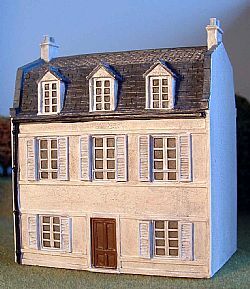 For this fact alone you should give them a look if you have any need for 15mm buildings. They also come packaged in boxes with individual foam packaging that makes them easy to transport and store. Recommended. Another line to consider is the Crescent Root Studio 15mm line. We have not seen these in person but they look very nice from the Website and come with a variety of paint options. They also have a number of larger buildings as well as nicely done terrain bases. They look like they would fit with the MBA buildings very nicely and seem better painted than the JR buildings. Unfortunately, they are also generally the most expensive of any of the buildings we have looked at. 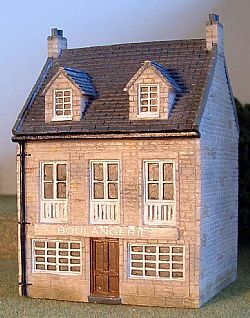 This entry was posted in 15mm, Buildings+Terrain, Miniature Wargames, Reviews, WW1, WW2.